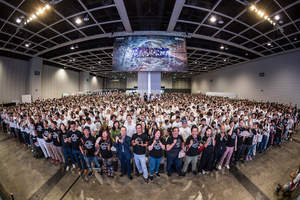 HONG KONG, CHINA--(Marketwired - Oct 8, 2017) - The last shots have been snapped at the Canon PhotoMarathon (CPM) Hong Kong 2017, the local edition of Asia's premier photography competition, with a record 3,000 contestants taking part in the event's unique and rewarding "Shoot for Hong Kong" experience today at the Hong Kong Convention & Exhibition Centre. For this day-long competition, CPM contestants were required to visit designated checkpoints within a fixed period of time and create photographic masterpieces based on chosen photo themes. To challenge participants' endurance, time management skills and creativity, all photo themes were announced only on the day of the event. Canon, which is celebrating its 80th anniversary this year, has organized the CPM in Asia for the past 15 years. This year the CPM is taking place across 12 Asian cities and countries. 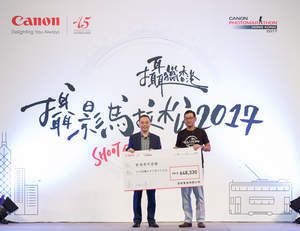 Today's competition, organised by Canon Hongkong, marked the 9th edition of the Canon PhotoMarathon Hong Kong 2017. Canon President and CEO Mr Shunichi Morinaga said, "Canon is constantly striving to enhance the PhotoMarathon experience every year, this year, contestants can enjoy photography seminar and latest product demonstration on site. Moreover, we brought local students to taste the competition so they could capture the city's facets guided by professional photographers. This has helped make the CPM a more inclusive event, one that can be enjoyed by photography lovers of all skill levels and ages." Contestants in both the Challenge and Open categories used interchangeable-lens-type digital cameras to create works based on themes that were announced over several stages. Contestants in the Challenge Category were required to shoot based on three themes, "Tone on Tone," "Intersection" and "Radiance / Resplendent," over a six-and-a-half-hour period, while contestants in the Open Category had to complete two themes, "Sense of Time" and "Distance," within a four-and-a half-hour time limit. The CPM offers a real "shoot for Hong Kong" experience by focusing on the charm of local communities. This year's secret checkpoint at HKFYG's multimedia centre - M21 in Aberdeen, offering a creative experience for all contestants. To encompass the beauty of both day and night in Hong Kong, the competition schedule for the Challenge Category was extended to evening. This enabled CPM contestants to employ scenery changes from day to night, capturing the beauty of darkness and creating photos with enhanced diversity. The School Category expanded the CPM's entry field this year, attracting 238 students from 35 teams. Canon hosted photography workshops for participating students before the competition to prepare them for the "Shoot for Hong Kong" mission. On event day, students put their skills to the test at the Asia Society Hong Kong Center and Hong Kong Park by taking photos themed "Grace / Elegance" within a specified time limit. Each year, Canon donates the competition's enrolment fees, with no deduction, to a worthy charitable organisation. For 2017, the beneficiary of the CPM Hong Kong is the Hong Kong Federation of Youth Groups (HKFYG). Established in 1960, the HKFYG is the city's largest youth service organisation providing opportunities and facilities for the social, educational, cultural and physical development of young people. Canon Hong Kong will use the HK$648,330 raised this year to support the HKFYG's Digital Adventure-Based Leadership Programme. One of the brand-new programmes at the organisation's Leadership 21, located at the Former Fanling Magistracy, this initiative aims to nurture cohorts of young leaders in the North District neighbourhood. By applying the latest digital technologies such as augmented and virtual reality, real-time data collection and online leadership questionnaires, the Digital Adventure-Based Leadership Programme will provide comprehensive, personalised leadership portfolios and reports for students, enabling them to track their progress in leadership learning and further enhance leadership skills such as effective communications, creative problem-solving and team-building. Mr Andy Ho Wing Cheong, Executive Director of the HKFYG, said, "We are pleased to receive the support of CPM contestants for our work promoting youth development. Since 2000, Leadership 21 Development has been nurturing young leaders by offering all-round learning and development opportunities. We hope that our brand-new Digital Adventure-Based Leadership Programme can inspire young people to realise their potential through the application of technology." One popular feature of the CPM is the exclusive souvenirs. In addition to fun-packed photography action, CPM participants also get the chance to enjoy special offers available only to contestants. This year's contestants received a camera bag and a complimentary event T-shirt. The CPM 2017 professional judging panel includes Mr Tsai King Yan, a founding honorary member of the Hong Kong Institute of Professional Photographers; Ms Topaz Leung, a veteran commercial, editorial, fashion and art photographer; photowriter Ms Celia Cheng; experienced sports photographer Mr Brian Ching; and Mr Dominic Chan, Senior Manager of Canon Hongkong. They will select the final winners from more than 7,000 remarkable entries, based on a range of criteria including relevance to the theme, creativity in interpreting the theme, and use of colour, light, shadow and composition. Results of the competition will be announced on 11 November 2017, including the "Best of Show" winners selected from the Challenge and Open categories. In addition to winning attractive category prizes, "Best of Show" winners from each competition will claim a spot in the Canon PhotoMarathon Asia Championship to be held in 2018, valued at more than US$5,000. The Canon PhotoMarathon Asia Championship will see the winners take an all-expenses-paid trip to a soon-to-be-announced destination with stunning scenery that promises to inspire any photography buff. Apart from the chance to explore various aspects of photography under the tutelage of a professional photographer, the event will also involve additional theme challenges to test the mettle of all championship contenders. Canon Inc. (TSE:7751 / NYSE:CAJ) was founded in 1937 in Japan. Its predecessor, Precision Optical Instruments Laboratory, produced Japan's first 35 mm focal-plane-shutter camera "Kwanon" in 1934. Canon Inc. eventually expanded into the photocopying and printing industries, launching Japan's first plain-paper copier NP-1100 in 1970 and the world's first inkjet printer BJ-80 in 1985. Through the years, Canon Inc. has acquired in-depth experience in digital imaging product manufacturing, and research and development. It is a leader in the development of innovative products and holds the most technology patents in the imaging industry. Canon Inc. also makes a significant contribution to the promotion of photography. Today, Canon Inc. has a strong global presence and is one of the most important market players in the imaging, office and industrial product categories. As of 31 December 2016, Canon's global revenue was US$29.3 billion. One of the company's first offices in Asia, Canon Hongkong Co., Ltd. (CHK) was established in 1971. It is responsible for the sales, marketing and after-sales services for all Canon product lines in Hong Kong and Macau. CHK adheres to Canon's corporate philosophy of "kyosei," which encourages the company and its staff to participate in social, charitable and environmental activities in the community. CHK implements internationally-recognized management systems and has achieved ISO 9001, ISO 14001, ISO 27001 (Canon Digital Production Center) and OHSAS 18001 certification. For more information about Canon Hongkong, please visit our website: www.canon.com.hk. Photo reference: The total of HK$648,330 from CPM Hong Kong enrolment fees will be donated to the Hong Kong Federation of Youth Groups, without any deductions. Standing left is Mr Andy Ho Wing-Cheong, the Executive Director of the Hong Kong Federation of Youth Groups; on the right is Mr. Shunichi Morinaga, the President & CEO of Canon Hongkong.